There are a few different options that are often mentioned regarding Django and eCommerce services. I could have rolled my own but I’m trying to get better about giving previously built and tested libraries more of a chance before doing so. 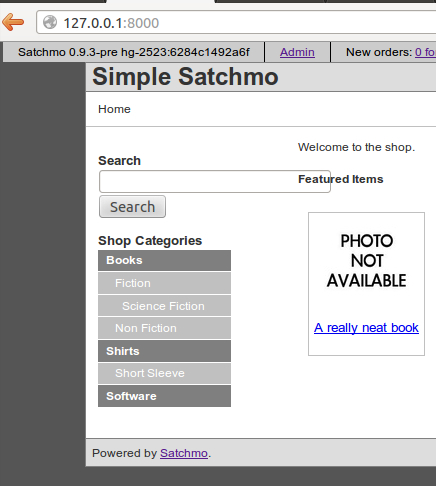 After some research, I decided to give Satchmo a try for a shopping cart front. While I did come across some newer projects like Satchless, I wanted to see what the most popular one was up to. Satchmo was the most talked about and came up the most in conversations so I decided to dive in. The Quick Start guide got me most of the way there but I did hit a couple of hiccups that I thought I’d share with everyone. First off, make sure you run everything in sudo. Once I got things installed, I wanted to dive right in and start configuring things. With the project cloned, I fired up the server with a python manage.py runserver and hopped over to 127.0.0.1:8000. I was a bit disappointed to see that the text input box doesn’t properly fit on the default index page. Maybe that should be fixed somewhere? I simply copied this file into my local application’s /store/templates/shop/ directory and I was able to start hacking around on the layout. # The last part of ENGINE is 'postgresql_psycopg2', 'mysql', 'sqlite3' or 'ado_mssql'. #'USER': '',             # Not used with sqlite3. #'PASSWORD': '',         # Not used with sqlite3. 'HOST': '',             # Set to empty string for localhost. Not used with sqlite3. 'PORT': '',             # Set to empty string for default. Not used with sqlite3. A quick visit to my local host and I could see everything was working splendidly. I didn’t have any of the sample data to get in the way and I could simply start going through and creating my site completely from scratch. Just what I was looking for. Hopefully you found this guide helpful to getting you up and running with Satchmo. If you liked this post, please follow me @randomdrake or consider following my feed.